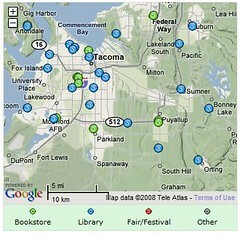 At the moment, any LibraryThing member* can add and edit their favorite locations. The entry form includes (or has the potential for) each venue’s address, phone, fax, email, and URL; a map to the place; amenities (like food and wifi); and RSS feeds for programs and events. Retrieval is a snap. A user can simply enter a city and LibraryThing Local’s page will feed upcoming events to them. A clickable map [see the example above] populates all the nearby venues. Without checking a lot of different websites, readers can see what authors are in town and what’s happening at your library AND all the other book places nearby. An independent book store owner I know had been wanting to share announcements of author events with other book stores and libraries. This makes the job much easier. An RSS feed might be all that’s needed. How do you suppose your library can benefit from this? *I immediately added my county library branches, my university’s library, and three favorite bookstores. It’s easy. Check too see if your library is listed. If you’re a LT member, add your favorite book place. Just saw an email newsletter from OCLC announcing “identities” in WorldCat. These act as author pages, summarizing facts about anyone listed in the OCLC database. I just gave a few a whirl and I’m impressed. Then I was able to access L M Montgomery’s “identity” page and see all sorts of author info. My favorite feature is the publication timeline which shows the frequency with which materials by (or about) an author have been published over the years. The bars in the graph are clickable, by the way. There are also lists of the author’s titles sorted by number of owning libraries, languages in which the titles were published, a subject-heading tag cloud representative of the author’s works, and a few other displays. All good stuff. OCLC didn’t invent this idea, but including identities (author pages) in their catalog is a welcome development.